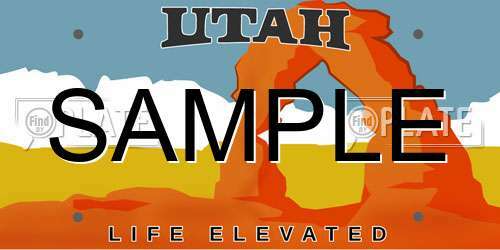 When you register your vehicle with the Division of Motor Vehicles in Utah, you will receive a standard issued plate. You can apply for specialty plates with custom emblems or designs. People with disabilities can apply for special plates and placards. Also, most plates in the state of Utah can be personalized with a custom plate number. Renewals and replacements can all be made in person, by mail, or online. Vehicles in the state of Utah must be registered with the Division of Motor Vehicles (DMV). If you are a new resident, you must register your out-of-state vehicle within 60 days. Residents who purchase a new vehicle must also register there vehicle promptly. Vehicles purchased from a dealership may provide you with temporary license plates to allow you time to complete your registration. When purchasing vehicles from a private seller, it is necessary to obtain temporary license plates in advance from an authorised provider. Temporary license plates allow your vehicle to operate legally on Utah roads for up to 15 days. You can register your vehicle in person at an DMV office in your county. These license plates require additional fees along with the standard registration fees. Specialty license plate fees vary by type in addition to require regular registration fees. For a complete list of specialty license plates available in Utah, contact a DMV office. If you have a disability and medical documentation, it is possible to obtain disability license plates or placards from the DMV. People with permanent and temporary disabilities can be issued a placard for free. Also, people with permanent disabilities and veterans with disabilities and obtain these plates for $16. You can look up available license plate numbers online. Note: Registration fees, service fees, and taxes are not included in the above fees. If you sell or trade your vehicle, you must keep your license plates. When you register a new vehicle, you may be eligible to transfer your previous plates. If you are unable to surrender your plates, you may be required to destroy them. Contact your local DMV office for more information for surrendering your license plates Utah. The decal stickers on the rear plate indicate when your vehicle’s registration is about to expire. You should renew your vehicle’s registration in advance to avoid late fees. Plate renewals can be made either in person, online, or by mail. When renewing license plates online or by mail, you may have to wait 1 to 3 weeks for the new decal stickers to arrive. Your new decals can be placed directly over the old ones. You are not permitted to send cash in the mail but instead should use money orders or checks for the DMV. If you are required to submit an emissions test, the maximum fee is $20.